SAN DIEGO, Jan. 7, 2013 -- Northrop Grumman Corporation (NYSE:NOC) has completed early delivery of two Global Hawk unmanned aircraft to the U.S. Air Force. Global Hawk allows military commanders to receive high-resolution imagery, survey vast geographic regions and pinpoint targets on the ground. Both aircraft were delivered ahead of schedule in late November. 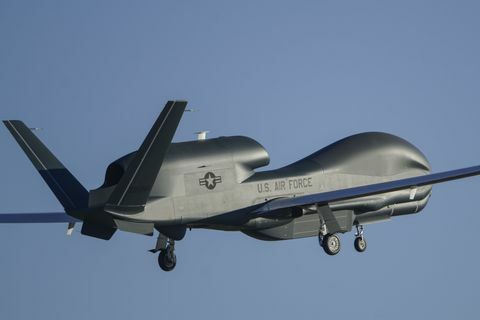 "Global Hawk's ability to fly more than 30 hours at high altitudes while gathering multiple types of intelligence data makes it extremely valuable to field commanders who need near real-time information," said George Guerra, vice president for Global Hawk unmanned aircraft systems. "These new aircraft add to that capability." In 2012, three new Global Hawks were delivered to the Air Force and five previously delivered aircraft completed installation of additional sensors that will allow them to gather multiple types of intelligence data during a single mission. A total of 37 Global Hawks have been delivered to the Air Force. Global Hawk carries a variety of intelligence, surveillance and reconnaissance (ISR) sensor payloads that allow military commanders to gather imagery and use radar to detect moving or stationary targets on the ground. The system also provides airborne communications and information sharing capabilities to military units in harsh environments. Combined with Global Hawk's ability to fly for long periods, the aircraft's 12,300 nautical mile range makes the system ideally suited to take on many different ISR missions. Global Hawk has logged more than 80,000 flight hours and has been used over battlefields in Iraq, Afghanistan and Libya. The unmanned aircraft system has also supported intelligence gathering and reconnaissance efforts following the devastating earthquakes that struck Haiti and Japan.